Do you, or someone you know, like to knit or crochet? Following on from last year’s wonderful success, we are on the ‘hunt’ for enthusiastic knitters to make as many woolly friends as they can and donate them to us here at the Hospice. Last year, our generous supporters brought to life hundreds of chicks and bunnies, each filled with a chocolate egg (Creme Eggs are the perfect fit!) and they were sold in schools, shops and local businesses, raising over £3500 for St Luke’s. Once your animals are ready to go, you can drop them off at St Luke’s Hospice or one of our shops, where we can help them find new homes. 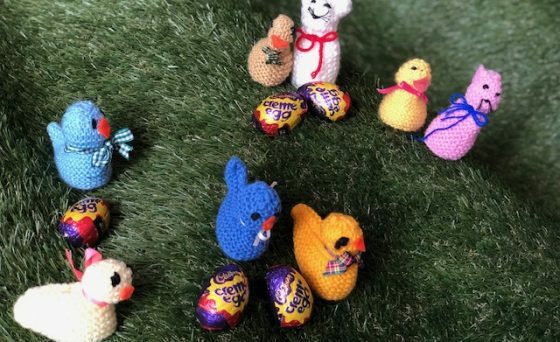 We are also in need of chocolate egg donations so that they can be paired with a knitted animal – and if you know of the perfect place to sell your knitted friends, whether it be your workplace, school or a shop, please let us know. Your chicks and bunnies can come in lots of different colours, shapes and sizes, so download your knitting pattern on the right and get creative for St Luke’s today! We’re an adult Hospice where people from all over Mid and South Cheshire can find a safe refuge during a difficult journey.